At 4.50m long, this new SUV stands out on the road thanks to its non-aggressive, powerful and dynamic personality. Bringing a breath of fresh air into the SUV segment, C5 Aircross SUV comes with a wide and imposing front-end design, high bonnet and flowing lines punctuated with strong graphic features such as the Airbump® with its coloured insert, large 720mm diameter wheels, 230mm ground clearance, rocker panel and wheel arch protectors, and stylish, two-tone roof bars. 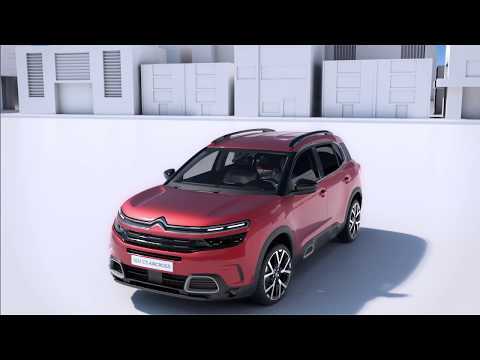 The cabin of New C5 Aircross SUV is spacious and luxurious, incorporating generous and flowing lines, whilst still offering optimal practicality. It features a robust dashboard with a horizontal layout and a heat-sealed fixing stretching across its width. On the drivers side, the cluster of digital instrument can be configured by the 12.3 inch touchscreen, which displays the selected information in the driver’s field of vision. With three individual, adjustable rear seats, New C5 Aircross SUV is the most modular vehicle in its segment. These seats are all the same width and can be adjusted forward and back, which makes it possible to adapt the interior space or boot capacity. They are incline-adjustable with five positions, and can be easily removed to form a flat floor thanks to the two-level boot floor. New C5 Aircross SUV also boasts many storage compartments, including the central armrest, which covers a large cooled compartment. These technologies represent the first steps toward autonomous driving: Active Safety Brake, Post-collision Safety Brake, Blind Spot Monitoring System, Active Lane Departure Warning, Adaptive Cruise Control with Stop&Go Function, Collision Risk Alert, Coffee Break Alert, Driver Attention Alert, Speed Limit Recognition, Highway Driver Assist, Automatic High Beam Function. 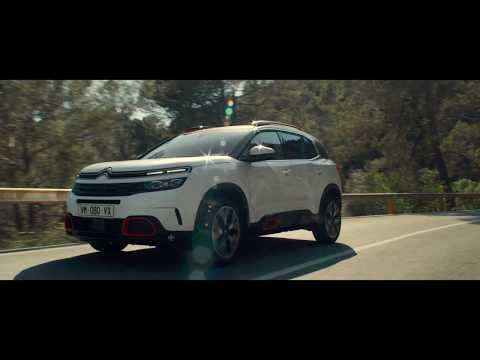 New C5 Aircross SUV provides passengers with intuitive systems at the cutting edge of technology to offer continuity between your digital universe and your car. The 8 inch touchscreen allows users to adjust the car’s settings, access the multimedia system, telephone, air conditioning, and navigation system, as well as: the Mirror Screen function, Citroën Connect Nav, Citroën Connect Box with Pack SOS& assistance included, wireless smartphone charging and ConnectedCAM Citroën™. BlueHDi 130 6-speed manual, BlueHDi 130 S&S 8-speed automatic and BlueHDi 180 S&S 8-speed automatic.